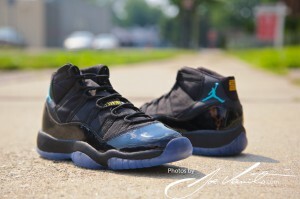 New detailed photos of the Retro 11 Gamma Blue have surfaced giving us our very first detailed photos of 2013 holiday season’s hottest release. Thanks to Joe Venuto we know exactly how the Gamma Blue 11 will look. These photos and video are of the GS version, so there are some minor differences mainly with the carbon fiber. Retro 5 "Black Tongue" and Foamposite "Weatherman" ticket information.